I'm out for now but should be back in a week give or take a couple of days. Tomorrow we leave for the Everglades and while I'm sorry to leave my beloved Smokies, new horizons beckon and the thought of possibly catching a snook or redfish, not to mention a tarpon, has me definitely excited. Don't miss me too much. If the lack of posting gets tiresome, just think about the nice warm weather I'll be enjoying along with the novelty of camping on the beach, just a few feet from the Gulf of Mexico. Today I caught my last trout on the 2011-2012 Tennessee fishing license. Until our state becomes enlightened and switches to a different system in which a license is good for a year from the purchase date, the end of February will continue to be time for a new license. After the quick fishing excursion I stopped for a new license. The fishing was not exactly as I planned. Upon arriving at the lake, I discovered that a threatened drawdown of the lake level for some bridge repairs had already commenced. The fish were not going to be in the expected places, but that just makes the game a little more interesting. Exploring in a couple of new spots brought continued disappointment until just before time to leave. As I was thinking about heading to the car, I spotted what looked like a rise ring. Of course, all such things must be investigated. We are in the full swing of preparing for yet another Spring Break Trip. Last year was the epic Grand Canyon adventure (Part One and Part Two) that I would love to be going on again. This year, however, we decided to return to the Florida Everglades. That's right! Another paddle through the mangroves, camping on beaches, and with a little luck, catching some new to me fish species. We leave in less than a week and this year's paddle will be longer than the last one. Go fishing now!!! The first early spring hatches continue to happen pretty much daily over in the Smokies. 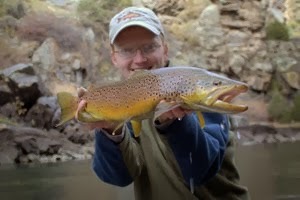 Some nice fish have been caught on dry flies for the fishermen willing to work hard and find those wary browns. Currently, bugs are hatching from near Townsend to up past Elkmont, but on the warmest days, the hatches are actually coming off pretty early. Larger fish will be easiest to catch on those days that keep all but the diehards off the water. Right now, the crowds are heavy on good days meaning you may be fishing used water. Thankfully, during hatches at least, you can still catch fish even on "used" water. 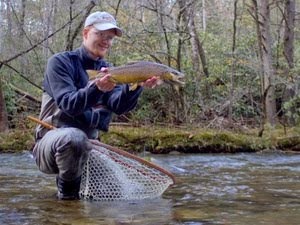 This is the best time to fish if you are a relative Smokies novice as fly selection can be as simple as tying on a Parachute Adams. However, closer inspection will often reveal the fish to be taking Blue Quills or Black Caddis in various stages. On a recent trip, I found a good hatch early in the day that dwindled to just a few stray bugs by early afternoon. During the hatch, the dry fly action was fast and furious. Before moving to another spot, I found a nice brown rising and got it to nail the dry. The first cast produced one of the most stressful refusals I have ever had as the fish rocketed out of nowhere just beneath the fly only to vanish just as quickly. 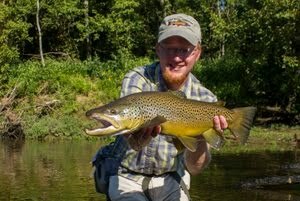 The second cast must have been a better drift and a beautiful brown was soon posing for a quick photo. The rainbows are fatter than I ever remember seeing a Smokies trout. The high water that has kept the tailwaters off limits to wade fishermen has done wonders for the fish in the Park. The warm winter probably helped as well. Anyway, I expect the next few months to produce some of the best fishing in the Smokies in the last 10 years. 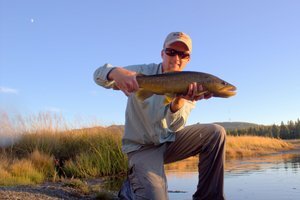 As soon as the tailwaters become fishable we should see similar epic fishing on them as well. Get ready for a great fishing year!!! "Actually, we sent some officers over to Arkansas and gave them swimming lessons," he said. "After we taught them, coyotes could swim over the Mississippi River." I'm always thoroughly amused at people who want huge populations of game species without any natural predators. Coyotes don't eat many deer to begin with, focusing mostly on much smaller prey. The extent some people will go to further their agenda is downright laughable. I'm just glad that Mr. Niceley was shown to be uninformed. Take a moment to read the article for your morning laugh, especially if you are from Tennessee. Rarely can one go hiking and hike to a destination in winter but return in spring. No, I'm not talking about the technicalities of when the calendar says the season has changed, but rather a snowfall so beautiful, so magical, and yet so fleeting, that if it weren't for the pictures I probably would assume the whole experience was just a pleasant dream. Hiking in the Smokies is never a guarantee, and in fact, I was not sure on this trip if we would be able to access our preferred trailhead. Upon discovering the road open we were all excited. When I found undisturbed snow on the trail, I was ecstatic. Being the first person through the woods after a fresh snowfall is something I would like to do more often, especially on popular hikes where you will rarely find the trail completely devoid of strangers. Our goal on this day was Ramsey Cascade. On the previous trip, my friend had a near death experience that could have been a lot worse than it really was. This time we were hoping for less wind and a safe journey. The trail ascends through the forest, never far from the nearby Middle Prong of the Little Pigeon River. At times you can see the stream while at others the trail is high on the hillside above the gorge and the water below is camouflaged behind layers of Smoky Mountain forest. Before leaving our van, I happened to glance in the side door window and saw a reflection of the magical wintry forest around me. Heading on up the trail brought deepening snow yet never too much for pleasant hiking. The sun started rising above the steep ridges and at times peeked through the trees, the snow sparkling as the sun's rays touched it for the first time. We made good time and even stopped long enough to find the exact same log that hit my friend last April. We jokingly took a couple of pictures, recalled how thankful we should be, and continued on our way. Moving higher through the forest, we found the banks of streams cloaked under the new snowfall. Further up the stream, the sun was now striking the canopy and its blinding light added a bit of mystery to our pictures. Finally, we reached our destination. Cold air was still rushing down the gorge and we quickly started to feel the chill. Standing around after a brisk hike in cold air makes everything seem colder than it really is. Accordingly we began the return trek much sooner than we would during warmer seasons. Moving back down the mountain was interesting. The snow was now in full melting mode, both falling off the trees (and usually down the back of my neck) and vanishing from the surface of the forest floor. By the time we made it back down the Middle Prong proper, only a dusting remained on the shady side of the stream. Everyone made it back in good time and even better spirits. We were amazed at our good fortune to hike in such a beautiful place at just the right time! I just want to give a shout out to everyone that stopped by Little River Outfitters on Sunday to join me for the fly tying session. Talking flies and how to fish them are always a lot of fun for me and I specifically want to thank Byron, Paula, and Daniel for having me. I will likely be heading up to the Park again soon to get in on the early spring hatches. Things have been amazing already this year from everything I have heard and I can't wait to get in on a good hatch myself. My friends Ethan and Joe Mcgroom were out fishing this past weekend and found some super nice fish. I made it up to the Park myself but had a slow day. 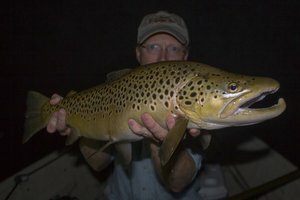 I got on one 18 inch brown as well as a nice 24 inch fish but ended up spooking both. At another spot I found 3-4 BIG fish in a pod feeding on something near the bottom. At least I know where they live and will be back. How awesome would it be to go back and find them rising?!? Thankfully some people had a good day out. Here is a picture of Ethan's nice fish. Both Ethan and Joe are great fishermen that know how to find the big guys.